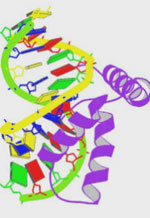 We welcome structural biologists and biologists engaged in functional investigations that benefit from structural data to participate in our PSI:Biology Technologies Workshop at NIH on December 12, 2012. The workshop will focus on new technologies for high-throughput protein structure determination developed within our Protein Structure Initiative, which is now in a phase called PSI:Biology. Investigators from the initiative will present their latest data and highlight problems and solutions specifically related to protein-protein, protein-ligand, protein-nucleic acid and other macromolecular complexes. In addition to exchanging ideas, workshop participants will have the opportunity to meet potential collaborators. This meeting is the latest in a series of popular and very productive annual events, dubbed “bottlenecks” and “enabling technologies” workshops. Registration (no longer available), which is now open, is free. If you have questions, especially as we build the agenda, or require any other assistance, please e-mail me or Alexandra Ainsztein or call us at 301-594-4428 or 301-594-0828, respectively. Natural products have been a prolific source of therapeutic drugs because they have been selected through evolution to be biologically active. New opportunities for natural products development are being made by genomic discoveries and are poised to reinvigorate this critically important area. At its September meeting, the NIGMS Advisory Council approved a new initiative that will use the cooperative agreement (U01) mechanism to support collaborative and multidisciplinary research aimed at developing high-throughput, broadly applicable approaches for natural products discovery that integrate genomics, synthetic biology and bioinformatics. Research under this initiative will provide the scientific community with tools and knowledge for inferring the basic structure of natural products and for producing natural products, regardless of whether the source is cultivable or the biosynthetic operon is expressed in cultures. We expect the funding opportunity announcement to be published in the NIH Guide early in 2013. In the meantime, I encourage you to start talking with potential collaborators and thinking about applying. For more on the current challenges of natural products discovery, read a Nature Chemistry article written by NIGMS Advisory Council member Scott Miller of Yale University and Jon Clardy of Harvard Medical School that summarizes discussions during our 2009 Natural Products and Biomedical Science symposium. One of our 50th anniversary scientific society symposia took place last month at the American Chemical Society (ACS) national meeting in Philadelphia. The day-long event highlighted the fundamental role of chemistry in biomedical science and demonstrated that NIGMS is a major supporter of the field. Tom Wandless of Stanford University and JoAnne Stubbe of MIT moderated the symposium. The theme of the entire ACS meeting, “Materials for Health and Medicine,” reinforced the importance of chemistry to many types of biomedical research, including the structural and functional characterization and manipulation of biological molecules; the characterization of metabolic pathways; the discovery, development and manufacture of therapeutics and diagnostics; and the design and construction of biocompatible materials and nanoscale devices. It would be an understatement to say that there was a high degree of interest at the meeting in these aspects of chemistry research. Among the evidence is the enthusiastic participation in the symposium by so many leading scientists, co-sponsorship by five ACS divisions (biological, organic, inorganic, carbohydrate and medicinal chemistry), designation as an ACS Presidential event , and excellent attendance. For more on our support of chemistry research, see the Feedback Loop post by Mike Rogers, the recent Chemical & Engineering News feature article , and the video of a press conference with chemical scientists whose careers were aided by our support . So far, NIGMS has funded the work of 36 chemistry Nobel laureates. We’ll find out on October 10 if that number increases this year. At the 150th meeting of our Advisory Council last week, I presented several budget slides that I’d like to share with you. They summarize funding allocations for this fiscal year, which ends on September 30. Figure 1 shows the $2.429 billion Fiscal Year 2012 NIGMS budget by major component. The biggest portion is for research project grants (RPGs), most of which are R01s. Due to the transfer of programs—predominantly center grants—from the former National Center for Research Resources (NCRR) partway through the fiscal year, the RPG budget as a percentage of the total is less than the estimate I provided earlier, while the centers percentage is greater. About 74%, or just over $1 billion, of the RPG budget goes to fund noncompeting grant commitments and about 25%, or $349 million, is used to fund competing grants. Figure 1. 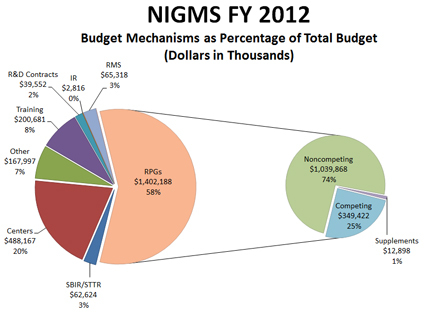 Breakdown of the Fiscal Year 2012 NIGMS budget into its major components. About 58% of the budget supports research project grants (RPGs), and of that, 74% is used to pay noncompeting grants, 25% to pay competing grants and 1% to pay supplements. Below is a closer look at the competing RPGs. It shows that 94%, or about $330 million, is used to pay investigator-initiated research and that the remaining 6%, or about $19 million, funds mainly R01 grants submitted in response to requests for applications (RFAs). At last week’s meeting, the Advisory Council approved one new RFA and the reissue of several other RFAs for funding consideration in Fiscal Year 2014. Figure 2. Breakdown of the Fiscal Year 2012 competing RPG budget. About 94% of the budget is used to pay investigator-initiated research and the remainder funds mainly R01 grants submitted in response to requests for applications (RFAs). 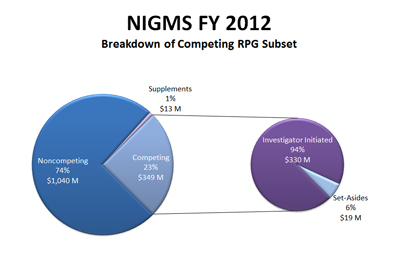 Another snapshot (Figure 3) shows a historical view of the RPG budget and number of RPGs compared to the total NIGMS budget. The increase in the total budget in Fiscal Year 2012 is due to the addition of NCRR programs. The decline in the number of RPGs is due to increasing grant costs. Figure 3. 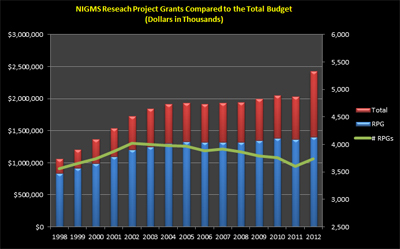 RPG budget and number of grants compared to the total budget for Fiscal Years 1998-2012. As we estimated earlier in the year, the Fiscal Year 2012 success rate is around 24%. We will provide information on the Fiscal Year 2013 budget when it’s available. Especially because it’s our anniversary year, I’m very pleased that basic biomedical research supported by NIGMS is receiving important recognition. The Albert Lasker Basic Medical Research Award is shared by Michael Sheetz of Columbia University, James Spudich of Stanford University School of Medicine and Ronald Vale of the University of California, San Francisco, for their advances in the detailed study of cytoskeletal motor proteins. The Lasker-Koshland Award for Special Achievement in Medical Science is shared by Donald D. Brown of the Carnegie Institution for Science and Tom Maniatis of Columbia University for advancing the study of genes as well as for their support of the scientific enterprise. I should also note that Dr. Brown was among the first speakers in our annual DeWitt Stetten, Jr., lecture series, which we established in 1982 to mark our 20th anniversary. Since the first Lasker Award was presented in 1946, 81 recipients have gone on to receive Nobel Prizes for their scientific accomplishments. Our Strategic Plan for Biomedical and Behavioral Research Training stresses the importance of creating an individual development plan (IDP) for every graduate student and postdoctoral scholar, not just those supported on formal training grants. The plan’s implementation blueprint addresses this action item, and we’ve since posted more information and links to sample IDPs. The latest addition to this IDP page is a new tool developed by the Federation of American Societies for Experimental Biology and the American Association for the Advancement of Science called myIDP . The tool makes it easy for grad students and postdocs to examine their scientific skills, interests and values; identify scientific career paths that best match their skills and interests; and set goals for the coming year. The site also links to articles for early career scientists to use as they plan their future. I encourage mentors and mentees alike to check out this great new resource. As I discussed in an earlier post, the Institutional Development Award (IDeA) program supports the development of infrastructure and capacity to enable investigators in IDeA-eligible states to become more competitive for NIH and other biomedical research funding opportunities. While the program has led to significant progress in the basic sciences, clinical and translational research in IDeA states has, for the most part, remained underdeveloped. To spur greater clinical and translational research in these states, NIH issued the IDeA Program Infrastructure for Clinical and Translational Research (IDeA-CTR) funding opportunity announcement last year. We have just awarded the first grants, to the West Virginia Clinical and Translational Science Institute (lead institution: West Virginia University) and the Louisiana Clinical and Translational Science Center (lead institution: Louisiana State University Pennington Biomedical Research Center). Among the activities these centers will pursue are partnerships and collaborations within and across IDeA states; clinical and translational pilot grants; clinical research education, mentoring and career development; clinical research design, epidemiology and biostatistics; and projects related to the specific health and research needs of their states. The National Research Council of the National Academies has released a report titled Transforming Glycoscience: A Roadmap for the Future . The report was sponsored by several NIH institutes, including NIGMS, along with the U.S. Food and Drug Administration, the National Science Foundation and the Department of Energy. It was prepared by the Committee on Assessing the Importance and Impact of Glycomics and Glycosciences , chaired by David Walt of Tufts University. Transformative capabilities for perturbing carbohydrate and glycoconjugate structure, recognition, metabolism and biosynthesis. Robust, validated informatics tools to enable accurate carbohydrate and glycoconjugate structural prediction, computational modeling and data mining. This capability will broaden access of glycoscience data to the entire scientific community. A long-term-funded, stable, integrated, centralized database that includes mammalian, plant and microbial carbohydrates and glycoconjugates and has links to other databases. The deposition of new structures using a reporting standard should be required. Integration of the glycosciences into the science curriculum. While NIGMS has a long history of investment in the glycosciences, including funding for the Consortium for Functional Glycomics glue grant and the development of methods and tools required for a full glycomics effort, the report sets an ambitious pace that would require a broad, multidisciplinary, multi-agency effort. It’s possible that the report may help guide the development of future NIH initiatives in the areas identified. Gerald Hart, Johns Hopkins University School of Medicine and a member of the committee that prepared the report, will brief the NIGMS Advisory Council of its findings at its September meeting. NAS staff involved in developing the report will also be in attendance to respond to questions.